We're approximately three weeks away from taking our first steps into the second quarter of the year and we're already seeing many new flagship smartphones getting ready to go on sale. On the Android segment there's the LG Optimus G Pro, the HTC One, and of course, the highly anticipated Samsung Galaxy S4, just to name a few. However, as we all know, the biggest competitor to the Android market is whatever Apple has to offer. The iPhone 5 has been a success, as almost every other gadget coming from the Cupertino-based company has been. However, the 6th iPhone (yes, it's a bit confusing, but despite its name, the iPhone 5 is the 6th iteration) is slowly but surely being overshadowed by what the competition is preparing to release in the near future. With that in mind, Apple should be brewing something, and judging by the latest reports and rumors, the company is seemingly bent on launching two new high-end smartphones this year, one of which will be an upgraded iPhone 5 that will wear the "5S" moniker, with the other being the next generation iPhone 6. According to the latest reports from CNET, the iPhone 5S has already entered the production phase. Allegedly, the handset will retain the same overall design as the iPhone 5, but it will evidently arrive with more powerful hardware. The 5S is also rumored to pack a new Apple A7 processor and a new, upgraded rear-facing camera. At this point little is known about the camera but given the already impressive nature of the camera on the iPhone 5 any potential improvement will be more than welcomed. Several analysts have speculated on when the 5S might go on sale with no consensus having been reached – while some claim that the gadget will arrive in August, others predict a launch within the June-July timeframe. Earlier reports coming from Business Insider indicated that the iPhone 6 might arrive with an oversized display (at least for Apple's standards), measuring 4.8 inches. The gadget could also lack a physical "Home" button and might benefit from full gesture control. One group has constructed several images of what the next iPhone might possibly look like. The photos don't depict an official render, but they have been designed based on the above guidelines. In terms of storage, the iPhone 6 could receive the same treatment as its larger distant cousin (the iPad). If so, the upcoming iteration might arrive with 128 GB of internal storage. Software-wise, the iPhone 6 is expected to introduce a newer operating system. As far as the release date of the device goes, there is a tremendous amount of speculation brewing. iOS 7 could be unveiled in June during WWDC 2013, after which the iPhone 6 might go on sale a few months later, but no exact launch date has been confirmed. 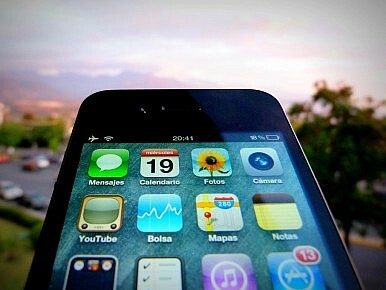 In the end, a sought-after smartphone such as the iPhone will always attract a great deal of attention. For that reason a lot of leaks, rumors, fan-made renders and speculations will continue to pour in during the next few months (like the rumors of a cheaper iPhone made of plastic that have recently surfaced – but that's another story). Treat them accordingly and remember that nothing is official…until Apple makes it so. iPhone 5S and iPhone 6 Rumors: A 2013 Launch? iPhone 5S or maybe an iPhone 6 coming soon? Check out some interesting photos.